Sameer is SendGrid's CEO. He has nearly 20 years of experience in successfully bringing high growth, disruptive cloud and enterprise software solutions to market. Prior to joining SendGrid, he served as Group Vice President and General Manager of the Cloud Platforms group at Citrix, driving the company’s product strategy for cloud infrastructure and server virtualization. 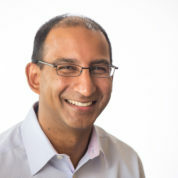 Sameer joined the company in 2010, when Citrix acquired VMLogix, where he served as CEO and doubled revenues during each year of his tenure. Prior to that, he worked for 12 years at Trilogy, where he held key leadership roles in sales, business development and product management and helped the company grow from a start-up to a $300 million business.